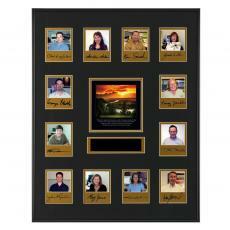 Our perpetual plaques keep employees happier and increase their loyalty to your organization. Price includes all engraving. The traditional year-end award ceremony provides an opportunity to acknowledge excellence in a formal setting. On-the-spot recognition is ideal for offering instant informal affirmation. Somewhere between these two very different approaches lies the often-overlooked perpetual award program. This is the 3rd Perpetual Award Plaque we have bought and they all bring home the message of hardwork and success. Our employees work very hard in order to try and get their face and signature on the plaque. This award really helped motivate my team. They really enjoy getting publicly recognized with having their name on this award. An award can take many different forms and can affect people in many different ways. It can portray feelings of satisfaction, gratitude or motivation. Giving an award is the optimal way to express your appreciation, while giving that person a tangible reminder of what he can accomplish. It commemorates an act of great accomplishment while emphasizing the gravity of that person's achievements. Everyone enjoys receiving an award. It is a validation that their hard work is appreciated and the potential rewards that result from that hard work. The distribution of awards to your fellow peers can be a very effective and influential tool. Many businesses and corporations give various awards to their employees as an additional incentive to improve workplace performance. Many companies have discovered the importance of distributing awards and have developed award programs. Having an award program in place to help regulate who receives which award is an effective system that has proven to increase motivation and help the morale around the workplace. At Successories Motivational Products and Awards we recognize how influential an award program can be. That is why over the years we have developed high-quality award programs including service awards, photo recognition awards, perpetual programs and more. Our advanced awards programs have helped establish many employee recognition programs and have been responsible for increasing productivity and morale in businesses all over. We are proud to offer many different types of awards for every occasion. No matter who you would like to express your appreciation for Successories has an award appropriate for that occasion. We have a large variety of awards to choose from to ensure you receive the exact award you need. Whether you need a glass, crystal or acrylic award Successories has it for you. By publicly recognizing the outstanding efforts of a key employee each month, perpetual programs are a valuable tool for providing year-long motivation to your entire staff. • Whether you choose to present the award in the form of a panel featuring each month's recipient, a monthly series of individual awards, or a combination of both, the constant visibility of a perpetual program creates an on-going focus on excellence throughout the organization. • The frequent regularity of perpetual awards creates positive energy in the workplace by offering an inclusive opportunity for every employee, even the newest hire, to earn well-deserved recognition. • The somewhat formal nature of monthly awards allows you to constantly reinforce your core values by spotlighting individuals who personify those values, By recognizing these "standard bearers" of your guiding principles, you provide your entire staff with a model they can emulate as they strive for success. Individual Award Programs include 12 separate but matching plaques. Each month, you simply provide your vendor with the name of that month's recipient and the award, complete with personalized plate, is shipped to you for prompt presentation. Award Panels feature 12 engravable plates on a single large plaque designed for display in an open workspace or common area. Per your instructions, your vendor engraves each month's plate and ships it to you. Plates are easily and securely inserted into position through the enclosed back of the panel. Complete Programs combine both individual awards and an award panel for a comprehensive approach. By providing an award the recipient can proudly display in his or her own workspace along with a common-area plaque reminding all employees that excellence is consistently valued, complete programs provide effective motivation at both the individual and the group level. With a variety of designs and materials to choose from, it's easy to find a perpetual award program that fits your organization's personality, values and budget. 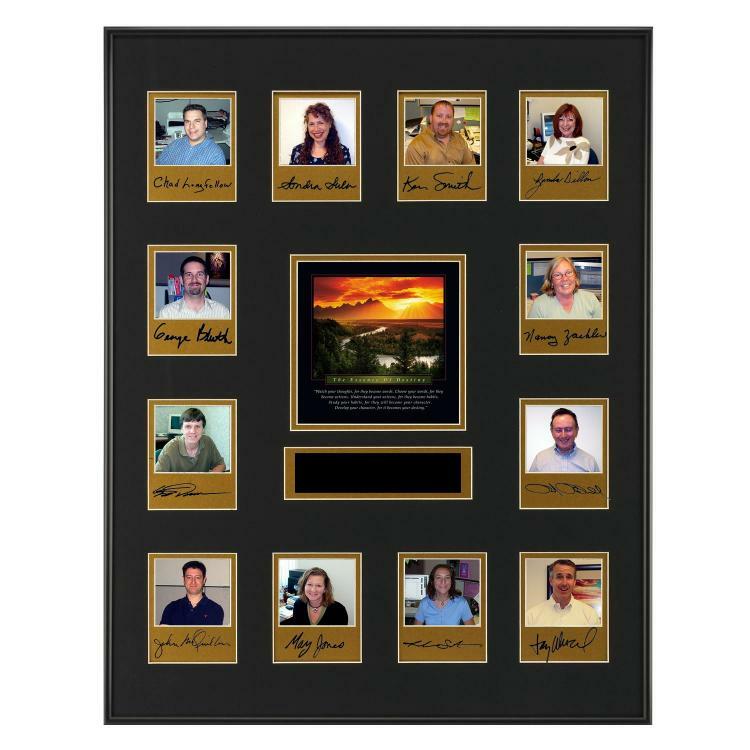 Whether you're looking to keep it simple with elegant engraved plates on a classic pewter-finished panel, make it personal with a plaque featuring photos and signatures of each recipient, or dress it up with a rosewood panel accented with a motivational message and image, the choice is yours…and the motivation lasting. Introduce a perpetual program or freshen up your existing program today. You'll discover the everyday encouragement it provides can transform your workplace in a way no other form of recognition can duplicate. Provide daily motivation for all with a perpetual award program. The traditional year-end award ceremony provides an opportunity to acknowledge excellence in a formal setting. On-the-spot recognition is ideal for offering instant informal affirmation. Somewhere between these two very different approaches lies the often-overlooked perpetual award program. Whether you choose to present the award in the form of a perpetual plaque featuring each month's recipient, a monthly series of individual awards, or a combination of both, the constant visibility of a perpetual program creates an on-going focus on excellence throughout the organization. The frequent regularity of perpetual awards creates positive energy in the workplace by offering an inclusive opportunity for every employee, even the newest hire, to earn well-deserved recognition. The somewhat formal nature of monthly awards allows you to constantly reinforce your core values by spotlighting individuals who personify those values, By recognizing these "standard bearers" of your guiding principles, you provide your entire staff with a model they can emulate as they strive for success. Individual Award Programs include 12 separate but matching perpetual plaque. Each month, you simply provide us with the name of that month's recipient and the award, complete with personalized plate, is shipped to you for prompt presentation. Complete Programs combine both individual awards and an award panel for a comprehensive approach. By providing an award the recipient can proudly display in his or her own workspace along with a common-area perpetual plaque reminding all employees that excellence is consistently valued, complete programs provide effective motivation at both the individual and the group level. Tag with a variety of designs and materials to choose from, it's easy to find a perpetual award program that fits your organization's personality, values and budget. Whether you're looking to keep it simple with elegant engraved plates on a classic pewter-finished panel, make it personal with a plaque featuring photos and signatures of each recipient, or dress it up with a rosewood panel accented with a motivational message and image, the choice is yours... and the motivation lasting. Glass, Acrylic and Crystal Awards: What's the Difference?